Success Local Limited have been working with Dial A Bin for many years. They have always expressed interest in improving their online visibility, with focus on boosting their commercial services. Our web designer Jonathan worked with Dial A Bin to design and development their current website, and ensure it matched their specifications. Our digital team also actively work on improving their online visibility and conversions with SEO and social campaigns. 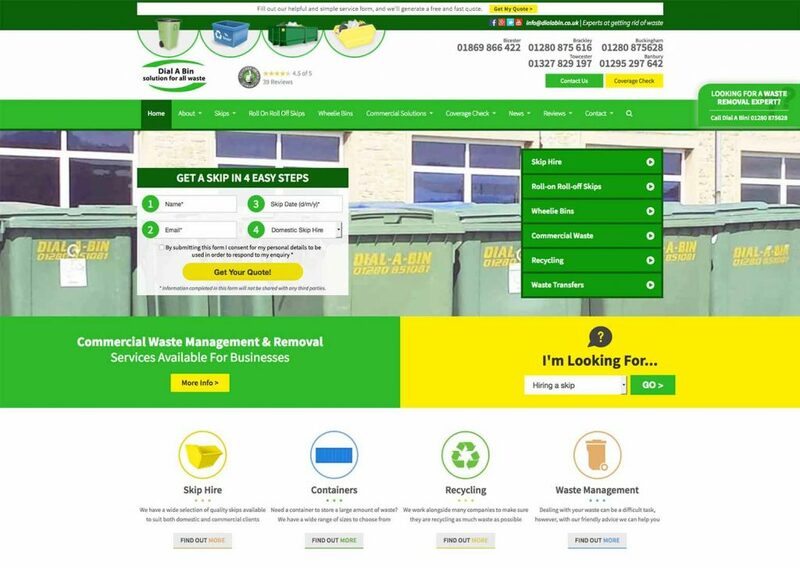 In 2014, Dial A Bin had been considering whether to update their existing website, which was starting to become dated and unsuitable for their requirements. The ambition was to develop a brand new website which correctly addressed their current services and business goals, whilst ensuring their existing website rankings within search results would not be affected. Success Local Limited completed a bespoke website design concept for Dial A Bin, undertaken by our web designer Jonathan. We worked with them to create a design that matched their specifications and exceeded expectations. The design went into the creation stage after being approved by Dial A Bin. Along the way we helped to complete any requested adjustments and tweaks to ensure they would be happy with the website. Since launching in late 2014, the website has continued to be successful for Dial A Bin and it still looks tremendous. To help ensure Dial A Bin’s website consists of the latest website trends and reflects their current business, we provide a monthly website maintenance service, ensuring their website is always up-to-date. We work with their team to provide solutions for important updates they’d like to make to the site, such as new pages and offers. We constantly evaluate and analyse their website to complete key improvements to improve user engagement and customer conversions. Since launching the site we have been focusing on improving their search engine rankings. This is important for any business wishing to appear on Google and provides a competitive edge over similar businesses within their coverage areas. It includes monthly work activity on their SEO campaign, which is currently undertaken by our specialist digital team, who provide regular client updates and help the site maintain positive search result rankings.